The reason that Divi is still the #1 WordPress Page Builder theme is that it constantly evolves, adapts and improves. Elegant Themes listen to the Divi community and give them the features that they ask for to increase efficiency, save time and make the page building experience much more enjoyable. The only problem with constant innovation, is that it can be difficult to keep track of all the new features, but don’t worry because in this post I’m going to take a look at eleven of the latest new features and give a brief overview of each. As new features are added to Divi and new versions released, Elegant Themes produce detailed posts, complete with videos, showing what the features are and how to use them. When I cover a new feature in a post on this site, I usually cover one feature at a time and add the Elegant Themes’ video to help explain the feature… but then I found a fabulous video by Darrel Wilson, which made my efforts look rather pedestrian. In his video Darrel covers eleven of the latest Divi features in just under fourteen minutes and he presents them with pace, enthusiasm and a generous helping of humour. So here you go folks, this is Darrel’s video in which he introduces the Divi features, explains each of them, shows how they are implemented and gives a demonstration of the feature in use. I hope that you enjoyed Darrel’s video and that some of his Divi enthusiasm has rubbed off on you. Coverage of this feature starts at 30 seconds. The Extend Styles feature allows you to take any style and extend it throughout the page, or to specific elements within specific locations, with just a few mouse clicks. If you have a particular colour, font, border style, box shadow or other style, and you want to use it elsewhere on the page, or even across the entire site, you can now extend those styles and make sweeping changes in just a few seconds. This is a great time-saving feature that you’re going to love. Divi now has more than double the number of column layouts, including new smaller 1/5th and 1/6th column types that you can use to build your layouts. These new column structures allow you to have 5 and 6 column layouts as well as combinations of the brand new 1/5th, 1/6th, 2/5th, and 3/5th column types. These smaller columns extend your creative freedom and allow you to play with the horizontal space in your designs and to build brand new design elements, such as large logo grids and image galleries. In total, 14 new layout structures have been added. Coverage of this feature starts at 2 mins and 6 seconds. And if you’re using Divi’s Free Layout packs, this is the perfect tool for customising them to match your own or your client’s brand. 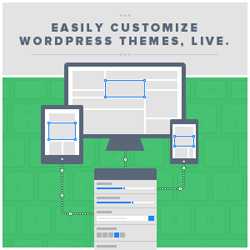 And Elegant Themes tell us that you won’t find this feature in any other page builder. Coverage of this feature starts at 4 mins. This feature introduces a new colour manager for Divi complete with a new interface that makes it easier to manage colours, access recently used colours and explore the colourscape for new and beautiful colour palettes for your website. Whenever you edit a colour in the Visual Builder, you get quick access to your customisable website colour palette. This is great when you’ve already decided on a colour scheme, but during your initial design process it’s not as useful. This feature introduces a much more dynamic colour system that feeds off your interactions to improve efficiency and spark creativity. If like me you struggle with colour combinations, this feature was made for you. Coverage of this feature starts at 4 mins and 30 seconds. This feature extends Divi Builder support to all custom post types, including support for popular post types such as WooCommerce products, the Events Calendar events and more. In simple terms, this means that you can now enable the Divi Builder on any type of post and you will no longer be limited to standard Divi post types such as pages, projects and blog posts. I’m sure that you’ll agree with me that videos like Darrel’s, which are full of enthusiasm, expertise and humour, make learning Divi so much easier. So thanks Darrel for allowing me to use your video on this site. Coverage of this feature starts at 5 mins and 30 seconds. This is my #1 feature and it really is a major design efficiency improvement for Divi. It makes it easier and faster to identify and access design options / settings for every element on the page, including module sub elements. With this feature, when you hover over an item a small blue circle appears and when you click it, you are taken directly to the settings for that particular element. No more selecting tabs and then scrolling through a long list of settings just to find the one you want to change. Just click that little blue circle and you will be taken straight to the setting you are looking for. Coverage of this feature starts at 6 min and 25 seconds. This is such a genius of an idea that I can’t imagine why other WordPress themes don’t use it. Divi Rollback allows you to roll back to your previously installed Divi version with a single click, just in case you experience any problems after updating. From your WordPress dashboard all you have to do is go to Divi > Theme Options > Updates and hit the black ” ROLLBACK TO THE PREVIOUS VERSION” button. Like I said, a genius of an idea. Coverage of this feature starts at 7 mins and 2 seconds. There was a time when the Divi Contact Form Module only allowed you to create pretty basic contact forms… but not anymore. The latest update of the Contact Form Module has taken what was a simple form builder and added features that have transformed it into something much more advanced and full of possibilities. It now has more input types, more customizability, field validation rules and even conditional logic. The updated Divi Contact Form Module can now compete with any of the dedicated contact form builders, that you do of course have to pay recurring fees for. Coverage of this feature starts at 9 mins and 1 seconds. The “Divi Design Initiative” is a design department at Elegant Themes whose goal is: “To create unique world-class Divi Layouts with original photos and graphics and to release those resources for free to the Divi community every single week”. Initially Elegant Themes released one Free Divi Layout Pack per week but recently increased that to two packs a week. Currently there are 72 Layout Packs comprising 549 Total page Layouts. The packs are complete websites, not just individual page layouts, they are the perfect way to have your website up and running with just a few mouse clicks and they are available via the Divi Layout Manager when you use the Divi Visual Builder. Coverage of this feature starts at 11 mins and 1 seconds. With some Page Builders, margins and padding can be very confusing but Divi allows you to change both from right inside the Visual Builder. All you have to do is go to the Settings panel and under Design > Spacing you can set custom Margins and Padding for left and right and top and bottom and thanks to the Visual Builder you can see the results as you make the changes. Coverage of this feature starts at 12 min and 8 seconds. Divi now has an API for developers that makes it easy to create custom modules that are compatible with Divi’s Visual Builder. The API comes with extensive documentation and tutorials, as well as a Create Divi Extension utility that will help you jumpstart your own custom Divi modules. Having a Divi API lays the foundation for a thriving development community that will greatly benefit every single Divi user as more and more third-party modules become available. 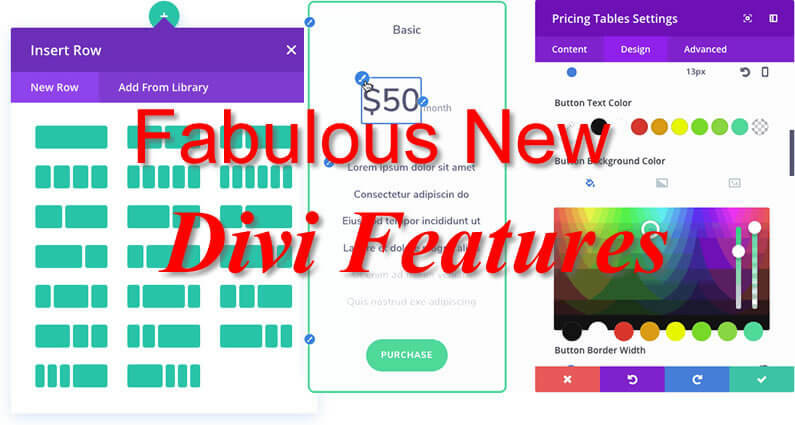 There you have it folks, eleven fabulous new Divi features that will save you both time and effort and make the page-creation experience an absolute delight. The features are varied and extensive and you don’t have to use all them, but it’s worth checking all of them out and adding the ones you like to your own workflow. If you’d like to use Divi’s fabulous new time-saving features on your next project, then please feel free to use my Divi theme 10% discount link below. My thanks and gratitude to Elegant Themes for the graphics used in this post and for providing the Divi community with the #1 Page Builder WordPress theme.